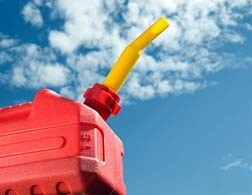 Most of us have seen or even used a plastic red gas can at some point in our lives, such as to fill up a lawn mower. Most people are completely unaware of the significant dangers these cans present? There have been at least 11 deaths reported and about 1,200 emergency room visits from injuries suffered from these ticking time bombs since 1998 (CPSC). With many filling up their lawn mowers all summer long, or those storing and gas and pouring it from a red can, we thought this would be a good time to make you aware of what could happen. The family of three year old Logan knows the danger of these well-known and widely used gas cans. Logan was playing in the garage when he accidentally knocked one over. The pilot light on the hot water heater nearby ignited the gas fumes that flashed back to the nozzle, turning it into a firebomb. Red gas cans are ticking time bombs that can go off in a half a second’s notice. The papers are filled with plenty of horrific, tragic stories of children like Logan knocking one over, fathers filling up lawn mowers, or people simply standing nearby one when static electricity spark the fumes. All of the testing that has been done by scientists, plaintiff’s attorney, and even NBC News results in the same conclusion: Under certain conditions, including a very low volume of gasoline left in a can, a flashback explosion can occur inside the plastic gas can when vapors escaping come into contact with a flame or a spark. The vapor that is outside the can “flash back” inside the can. If it does, and the mixture left in the can is a certain concentration, an explosion can occur. Perhaps what is bothersome about the deaths and injuries caused by the cans is that these explosions are completely preventable, if only the manufacturer had equipped them with a part called a “flame arrester”. It costs less than one dollar. Blitz U.S.A. makes the gas cans and they are aware of the numerous stories of peoples’ lives being endangered. They know that by spending a few extra pennies per can that explosions could be avoided and lives saved. They included these flame arresters in the older model metal cans they made, but failed to put them on the red plastic cans, knowing it is a safety measure. According to the Consumer Product Safety Commission, 95% of gas cans sold in the U.S. are read plastic cans. 19 million a year are sold, and they do not include a flame arrester. There is a workplace standard for these plastic cans (standard 1926.155), yet there is no standard for consumers’ safety. Until 2009, Blitz did not make its gasoline cans child proof. The 2008 Children’s Gasoline Burn Prevention Act closed a loophole in the Poison Prevention Act and mandated that all gasoline containers after January 2009 would have to be child proofed. The National Fire Protection Association (NFPA) provides safety tips for using gasoline, and these are measure that can really make a difference. You can read the tips here. For a Free Consultation with one of our top-rated attorneys, call the Burn Injury Firm at 866-293-2615.